Designed to generate power for charging batteries frequently used on Marine Seismic towed equipment, the Ampair UW100™ manufactured by Seamap is a powerful and efficient solution, providing 100W continuous battery charging power at 8 knots submerged tow speed. The Ampair UW100™ underwater generator has been manufactured commercially by Ampair in the UK for 20-years – Seamap acquired the intellectual property and manufacturing rights for the product in February 2015. 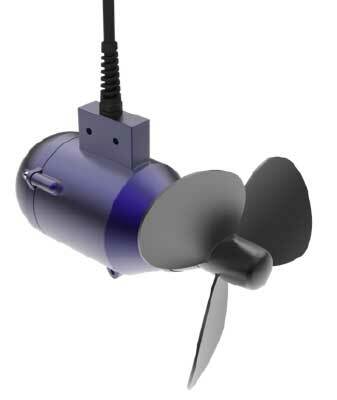 The Ampair UW100™ is a three-bladed turbine intended for use in fast flowing water and is ideally suited to the demands of Marine Seismic Exploration – generating a maximum of 100W of DC current at 12V or 24V to charge batteries – whilst being towed behind the seismic vessel. The radial flux permanent magnet generator is housed within a pressure compensated oil filled cast aluminum casing. The casing is sealed with dual redundant seals throughout and there are only two transits into the generator section: one for the turbine shaft and one for the electrical cable. The turbine is bi-directional but because of flow obstruction by the body it is most efficient if facing into the water flow.